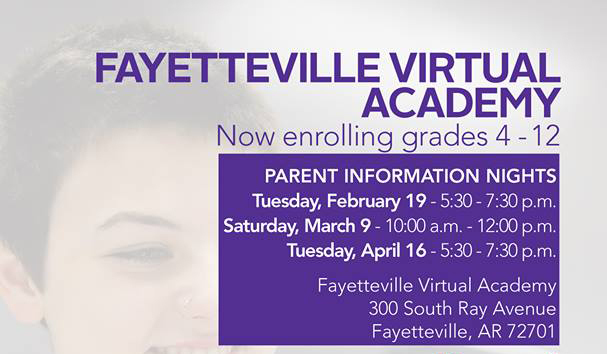 Fayetteville Virtual Academy is now enrolling grades 4 - 12 for the 2019-20 school year. Tuesday, February 19 - 5:30 - 7:30 p.m.
Saturday, March 9 - 10:00 a.m. - 12:00 p.m.
Tuesday, April 16 - 5:30 - 7:30 p.m.
Fayetteville Virtual Academy is an open-enrollment school. Students who reside in the Fayetteville Public School District attendance area are eligible to attend FVA. Students who reside in the state of Arkansas, but outside the Fayetteville Public School District may apply to enroll in FVA but will only be accepted under the School Choice Act of 2015 or by receiving written approval from their residential school districts through the petition process. Students are not required to enroll on a part-time or full-time basis and may choose to withdraw. If the student and parent no longer believe that virtual learning is an appropriate option, please contact the student’s designated school counselor at the school of primary enrollment to discuss other enrollment options. Complete an application online. Upon submitting your application, you will receive an email confirmation from FVA@fayar.net.